A Nor’easter is an extratropical cyclone that develops along the East Coast of the US. It produces strong northeasterly winds that can bring potentially dangerous wet snow or heavy rain to the East Coast and further inland. Better prediction models would help warn people to prepare for Nor’easters, which helps to reduce fatalities and economic damage. For forecasting and predicting Nor’easters, scientists use tools like the NCAR Community Earth System Model, a computer generated high-resolution climate simulation model. 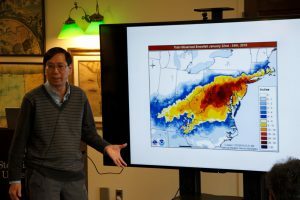 Dr. Chang and his research team not only study Nor’easters, but also extratropical cyclones in general. They have found that upper level waves of the extratropical cyclones occur consistently within Rossby wave packets, which form surface cyclones. This important finding helps predict cyclones days before they form. 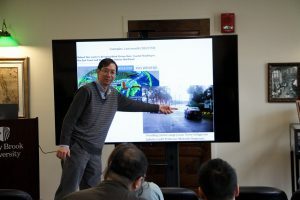 Dr. Chang also discussed and analysed extratropical cyclone activity change during climate change. 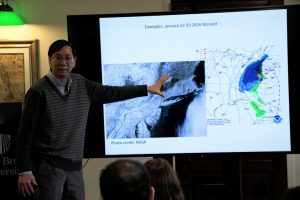 Through the lecture, audiences gained a deeper understanding of how Nor’easters are formed and are predicted. 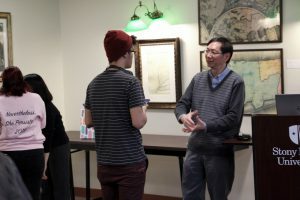 This intriguing lecture attracted faculty, staff, and especially students from the School of Journalism who enthusiastically interviewed Dr. Chang.